Vacuums are used to keep your home clean but don’t forget to clean your vacuum. The vacuum needs at least a clean once in six months. If you are using Dyson vacuum here is some easy steps to clean the vacuum. Remove all the parts separately. Remove the filter (if the edge is torn or damaged replace the filter). 4.Keep the canister in washing tub (the lever at the back of the canister helps to separate top and bottom). 5.Open and wash the canister in water. 6.Take the dish soap and wash the canister completely. 7.Wash the filters and make it dry completely for 48 hours (or else this will give you some strange odor). 8.Clean the rest of the vacuum using disinfecting wipe cloth. 9.On the back of the vacuum, you find some base/switch, open and clean the dust. 10.Unscrews the screws on the bottom of the vacuum to clean the brush. 11.Use scissors to cut the hairs on the brush. 12.Reconnect the vacuum once the process is completed. 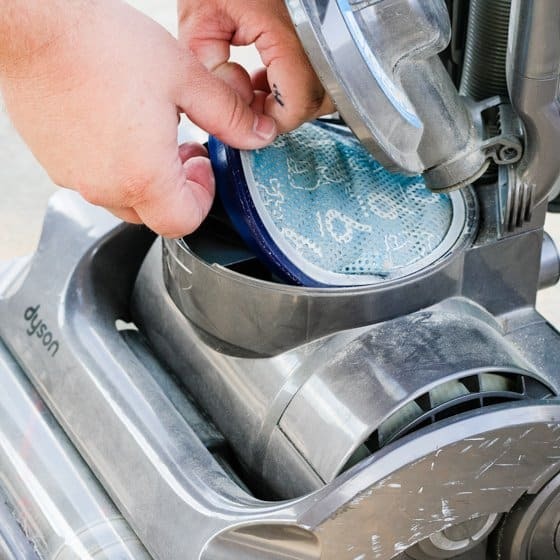 The above steps show you how to wash and clean the Dyson vacuum tubes. Thanks for reading this article.